The mayflies have around forty families with about 4,000 species, so classification of this organism is not a small task. In fact new species are still being described. New species in the Tricorythopsis genus were described as early as 2008 (Dias, 2008). Below is the complete classification of a particular mayfly species. 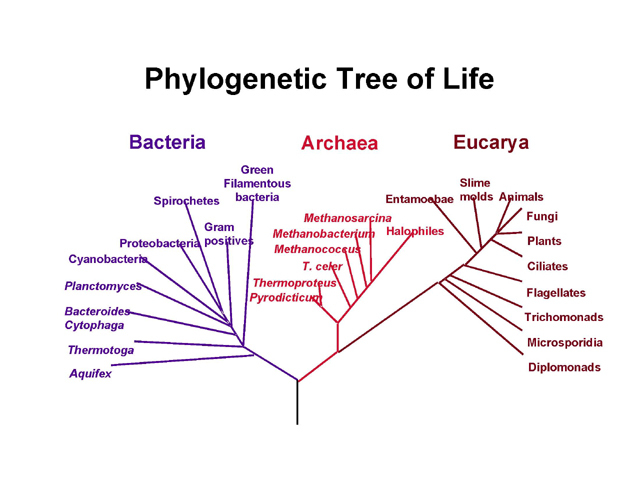 Family: Leptohyphidae means the "Little Stout Crawlers"
The phylogenic tree of life image above shows a very broad phylogenic tree of numerous organisms from all three domains. Mayflies are members of the Eukarya (Eucarya) domain under the animal kingdom. The image to the right is a phylogenic tree more specific to mayf lies. It has been modified by me from the Carlos Molineri (2006) study. The study was done on the Leptohyphidae family based on a database of multiple morphological features. The modified tree to the right shows groupings of the Tricorythopsis and Leptohyphes families with their respective species (click on the image to enlarge). The study was based off of morphological features with implied weighting, the numbers above the branch points show absolute and relative Bremer support. For more information about the extensive mayfly classification, visit entm.purdue.edu. I hope you have enjoyed the journey through the wonderful world of mayflies! If you have any questions or comments please don't hesitate to contact me.